Hope remains for Edge of Tomorrow 2 to become an actual movie that happens, rather than a long-hoped-for sequel that never materializes. 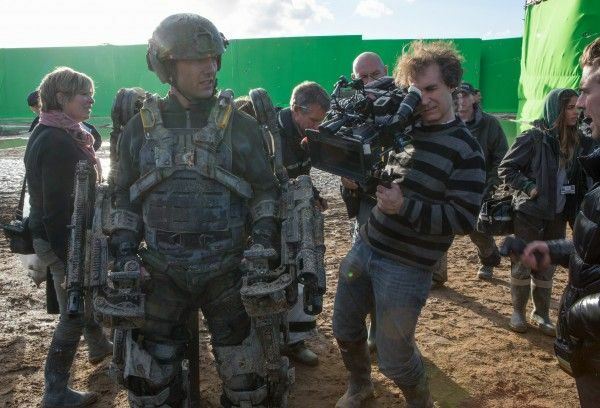 Director Doug Liman’s 2014 sci-fi actioner didn’t explode at the box office, but it earned high critical praise and grew its legion of fans once it hit home video, offering up a smart and refreshingly unique blockbuster that stood in direct contrast to the plainness of other big-budget fare. Liman, stars Tom Cruise and Emily Blunt, and writer Christopher McQuarrie all expressed interest and desire to make a sequel, and while it’s been in development for a few years, Liman says Edge of Tomorrow 2 may finally be close to happening. So how soon is that window? Is Edge of Tomorrow 2 Liman’s next film? Liman just entered post-production on the sci-fi YA adaptation Chaos Walking, starring Daisy Ridley and Tom Holland, and while he doesn’t confirm when the window to shoot Edge of Tomorrow 2 would be, it seems feasible it could be in front of cameras at the end of this year or sometime in the first or second quarter of 2019. Chaos Walking has a 2019 release date, so that would give Liman the bulk of this year to finish that up. Blunt most recently wrapped the thriller A Quiet Place and doesn’t have any impending shoots on her schedule (at least officially) for 2018, and Cruise is due to shoot Top Gun: Maverick at some point this year and potentially film Quentin Tarantino’s new movie this summer if he decides to sign on to that project. Again nothing’s confirmed for when Edge of Tomorrow 2 filming might begin, but the window of availability for Cruise, Blunt, and Liman would appear to be at the tail end of this year or the first half of 2019. Edge of Tomorrow was a delightful surprise and one of Liman’s best films, so it would similarly be a joy to see everyone return for a follow-up. And while the premise of the sequel is under wraps, it’s been teased as “a sequel that’s a prequel,” thus ensuring this is one franchise that won’t be going down a traditional route.